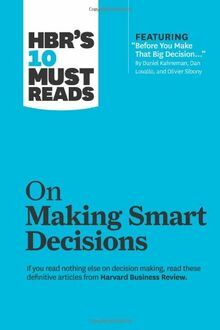 NEW from the bestselling HBR's 10 Must Reads series. Learn why bad decisions happen to good managers--and how to make better ones. If you read nothing else on decision making, read these 10 articles. We've combed through hundreds of articles in the Harvard Business Review archive and selected the most important ones to help you and your organization make better choices and avoid common traps. Leading experts such as Ram Charan, Michael Mankins, and Thomas Davenport provide the insights and advice you need to: * Make bold decisions that challenge the status quo * Support your decisions with diverse data * Evaluate risks and benefits with equal rigor * Check for faulty cause-and-effect reasoning * Test your decisions with experiments * Foster and address constructive criticism * Defeat indecisiveness with clear accountability Looking for more Must Read articles from Harvard Business Review?